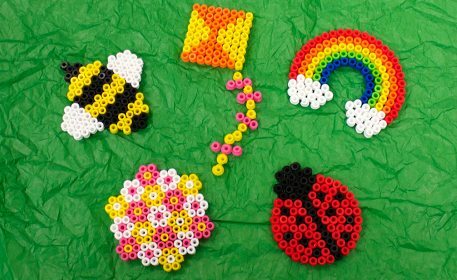 Use melty beads and the different peg board shapes to create a kite, bumblebee, floral pattern, rainbow and lady bug! To create these designs, lay melty beads onto the pegboard shapes as shown. You can easily switch out the bead colors for colors of your choice! To melt the beads, follow the instructions included in your package or read about the Basics of Melty Beads here!